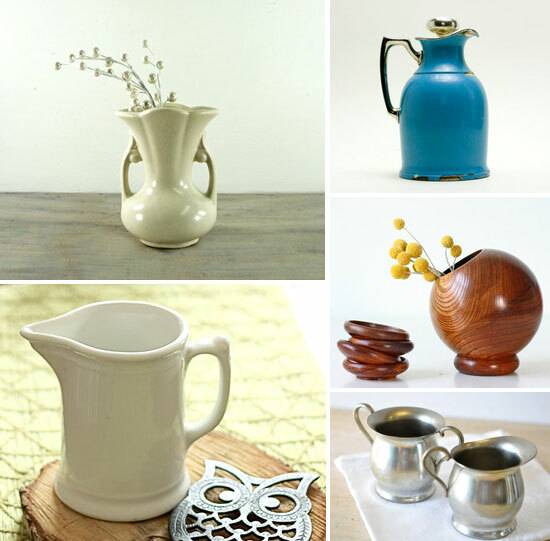 Vintage vessels bring instant character to a space. I love this grouping of three 19th century apothecary bottles from Route 11 Vintage in Raphine, Virginia. Standing together, you can better see the form and beauty each one offers. I have a thing for anything robin's egg blue, which is the color of this graniteware coffee pot collected by Old Time Pickers in Kentucky. How great is this vintage repurposed liquor decanter? Inspired from a vintage perfume label, Tammy Serrano of one of my favoirte shops, Cloth and Patina perfectly embellished this old decanter. I'm really wanting a collection of vintage apothecary bottles after seeing how pretty they look together on this tin tray. This rustic tray is included- how great is that? And comes via Jenna's Beach Retreat in Orlando, Florida. Also from Cloth and Patina is this brass veseel, etched with a pretty floral pattern. I absolutely love the color and shape of this retro molded plastic pitcher. Beverly Diane, the curator behind Tejas Vintage, shares that this vessel "holds 2 quarts and is nearly indestructible."